If you don’t already have the Zombie Plague digital conversion for BGE, you need read no further. But if you have it and like the game, this Expansion Pack should interest you. It takes the game to a whole new level and greatly increases the game’s replayability. 1. Three new maps/gameboards (all created by Kwanchai), including “The City”, “The Island”, and “The Church by the Cemetery”, and three pre-configured Game Files for playing with these maps. 2. Five Rules Expansions PDFs (developed by the Zombie Plague communities on the Yahoo! Group and on boardgamegeek.com). These Rules Expansions include: “Beat ’em or Burn ’em”, “Mind the Baby”, “Crawlers”, “Twitchers”, and “The Infected”. 3. Ten new tokens required for playing with the Rules Expansions. 4. An updated Zombie Plague card deck which includes seven new cards added by the Rules Expansions. 5. Four “Saved Gard Games” files, pre-configured for each of the four maps to minimize setup time and to give each type of game a unique feel and “realistic” mix of Weapons and Items. 6. Two new custom die types, seven new Dice Macros, and five new Reference Tables. A new Dice Key graphic is also included, to use with the “Library” feature. 7. An updated version of the Game File for the original Zombie Plague game, which allows for the use of any or all of the Rules Expansions. 8. Seven sound effects, to liven up any Zombie Plague game. I recommend mastering the original Zombie Plague game before adding any new rules from this Expansion Pack. Installation instructions are included in the download. Note that this needs to be installed by the host and all the players. This preview pic shows a few elements from the Expansion Pack. 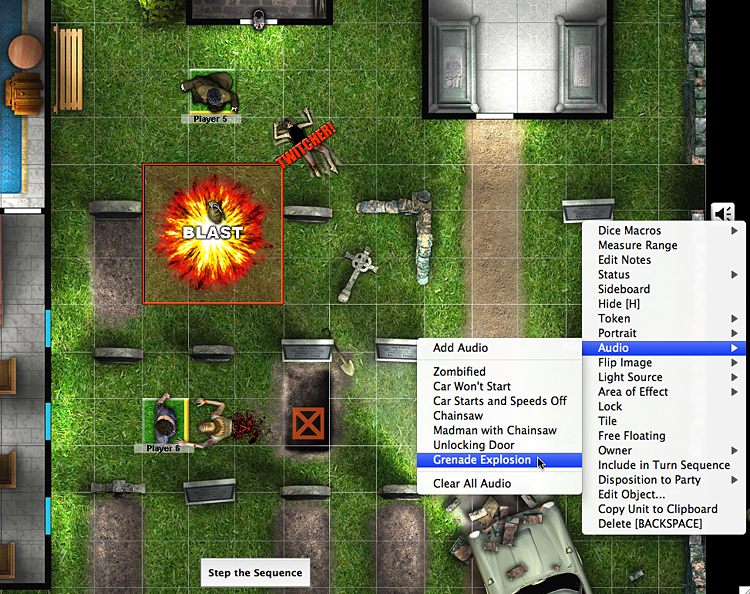 A “Crawler” (a zombie with no legs) is about to attack Player 6, while Player 5 blasts some zombies with a grenade. A “Twitcher” nearby poses no immediate threat, but those things are unpredictable, so it’s best to keep your distance. There’s a locked door to the north, but who’s got the key?